Home » ITIL » What’s new in ITIL 4? 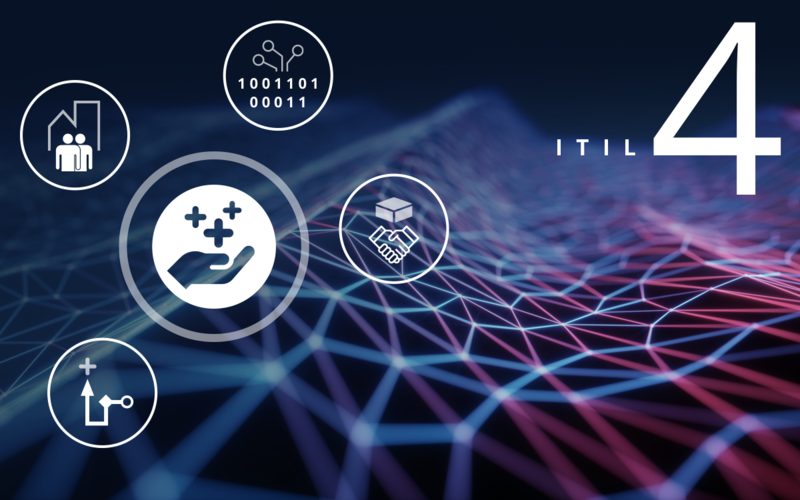 After months of build-up, ITIL® 4 has finally been released. The first publication in the ITIL 4 update, the ITIL Foundation ITIL 4 Edition book, was released on Monday 18th February at Pink Elephant’s Pink19 conference in Las Vegas. But what has changed in the latest update? We’ve rounded up the key information from this latest release. ITIL—the IT Infrastructure Library is a set of publications which capture proven best practices for IT service management (ITSM). ITIL is the dominant framework for ITSM best practices across the globe—with over 5 million practitioners certified at Foundation level or higher. It includes guidelines on how organizations, large and small, can improve the way they plan, deliver, measure, and improve IT services and support. ITIL 4 is the most recent update of the ITIL framework, continuing an evolution of documented ITSM best practices which stretches back to 1986. The “ITIL Foundation - ITIL 4 Edition” (202 pages) was published in February 2019, and will be followed by five detailed volumes across 2019 and early 2020. Unlike the previous ITIL 3 edition, where the publication of the entire library was held back for a single big bang launch, the release of ITIL 4 is being staggered so that ITSM practitioners can benefit from content earlier, offering a more agile approach. The timescale of this refresh project reflects the growing complexity of modern service management, as well as the extent to which business and IT have changed in the last decade, and the level of diligence required for such a large project. The release of the published ITIL 4 Foundation book coincides with the availability of ITIL 4 training and certification—provided by organizations across the globe, such as Pink Elephant. Why is ITIL being updated now? It has been almost 11 years since the last major update (ITIL V3 in May 2007) and 8 years since the last minor refresh in 2011 (ITIL 2011). A lot has changed in both the business and IT service management spheres since then, and in that time, IT has become even more critical to organizations across the globe. Technology is rapidly redefining what businesses offer their customers, how they operate, and the way they do business with customers. For an organization to compete in such a volatile environment, IT needs to be well-equipped to deliver new IT services and solutions faster than ever before. Under pressure to increase the pace of innovation (while still working within strict cost and resource constraints) IT departments are forced to be creative in developing new ways of thinking and working—like DevOps, Agile, Lean IT, IT4IT, SIAM, and others. The challenge for the ITIL 4 refresh has been to work out how these new practices should be folded into (or interfaced with) ITIL to create harmony and encourage collaboration. New technologies have also emerged and hit mainstream adoption in the last decade: cloud, hybrid IT, automation, virtualization, containerization, microservices, IoT, big data, AI/machine learning, and more. These are impacting the way IT services are conceived, planned, architected, deployed, operated, and supported. What does the ITIL 4 update process look like? In November 2017, Peter Hepworth, CEO of Axelos – the organization responsible for ITIL - announced that a major update to ITIL would take place in 2018. A Lead Architect Team was formed, including representatives from Axelos and 10 respected ITSM experts from across the globe. The Lead Architect Team consulted with the ITSM practitioner community across the globe, to unearth new principles (ways of thinking) and new practices (ways of doing) which are delivering real benefits—e.g. they work, and they work well. Over 2,000 IT practitioners were involved in this Global Research Program. Of course, although driven by large-scale community crowdsourcing, there is a need for intelligent curation to turn this raw information into a set of consumable publications which fit around a clear framework/model. It’s a large body of knowledge (page for page about four times bigger than the Project Management Body of Knowledge), so a cohesive structure is essential to help people navigate the content and get value from it. The whole process has been guided by the Lead Architect Team and supported by around 150 writers and reviewers. How is ITIL 4 different? ITIL 4 is not a wholesale replacement of ITIL 3; it is an evolution. Indeed, many of the practices found in the old ITIL 2 and ITIL 3 books are still relevant to organizations today, so much of the previous content has been adapted to meet the current challenges. However, ITIL 4 expands the ITSM body of knowledge to cover new questions and challenges—such as how does ITIL mesh with practices such as Agile, DevOps, and Lean IT which have achieved mainstream adoption in the last decade. Structurally, ITIL 4 will be a little different from ITIL 3. The service lifecycle model in ITIL 3 (Service Strategy, Service Design, Service Transition, Service Operation, CSI) has evolved to take a six-step Service Value System (SVS) perspective—Plan, Improve, Engage, Design and Transition, Obtain/build, Deliver and support). Where ITIL 2 was very process focused, and ITIL 3 was service focused, ITIL 4 is value focused. Axelos describes this as a “new holistic end-to-end view of service creation”. This is the next evolution of ITIL—helping IT people align everything they do with business needs. It integrates what’s happening in IT service management with what’s happening in other areas of IT and the business to drive more value creation, more quickly. It’s about eliminating waste by keeping focus on value-creation, resolving conflicts, and encouraging collaboration. To help drive this shift, ITIL 4 introduces some high-level considerations : The 4 Dimensions Of Service Management and 7 Guiding Principles (which have a similar ring to the Principles behind the Agile Manifesto). From a process perspective, ITIL 4 covers 34 areas, now referred to as practicesinstead of processes. Some of these have been adapted and carried over from ITIL 3. Some have a lineage that stretches back to ITIL 2, and possibly all the way back to ITIL 1 (known then as GITIMM). Others are completely new to ITIL 4. Over the next few weeks we will be taking a closer look at what’s new in ITIL 4, including a deeper look at the Service Value System (SVS), the 4 dimensions of service management, the 7 Guiding Principles, and a deep-dive into the new practices which have been introduced.